I first discovered 8-BITchin’tendo on MySpace (of all places.) His jams picked me up by my heart and brought to a place full of funky Nintendo riffs. The only thing that hurt was the quality of the MySpace stream, but thanks to NoiseChannel.org, you can download NINETEEN of his tracks for free in any of Bandcamp’s high-quality audio formats! Awesome! The opening track, Princess Toadstool, is one of those tracks I just can’t shake from my head. When I first heard it, I played it on repeat for over an hour. The whole album is an exceptionally programmed NES masterpiece, with quality recording and an authentic chiptune sound. 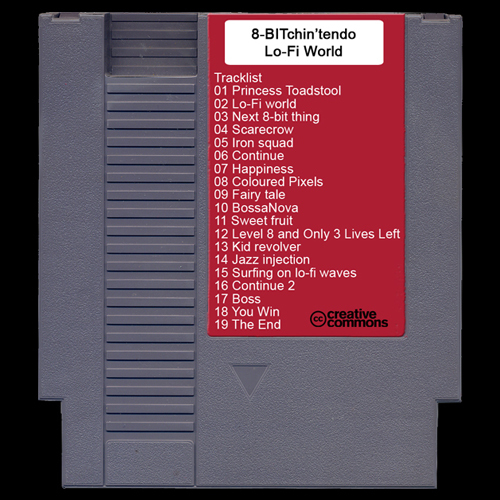 Released for free under Creative Commons, 8-BITchin’tendo’s Lo-Fi World is not to be missed!